, by Sexton, Timothy J. 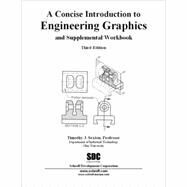 A Concise Introduction to Engineering Graphics (formerly titled Engineering Graphics Theory and Problems) gives students a basic understanding of how to create and read engineering drawings. The book consist of thirteen chapters that cover the basics of Engineering Graphics. The text is 142 pages in length and is followed by 40 exercise sheets. The exercise sheets both challenge the students and allow them to practice the topics covered in the text. Instructors have the choice of four different sets of exercise sheets to be bundled with this textbook. The text from the chapters are the same and the problem sets are similar. Instructors can switch the problem sets every semester to discourage students from sharing old assignments. This textbook may also be purchased without a workbook to be used as a text only.